BMW's latest — and smallest — new crossover concept is the BMW X1, seen here on the floor yesterday at the Paris Auto Show. It looks a little more robust in person than when we saw leaked press shots earlier in the week, but it's still hard to get excited about another crossover, particularly one that looks, and is bound to drive, like the underwhelming X3 we already have, only with less room. If BMW had managed to turn the potential of the 1-series into reality, we might be singing a different tune. They didn't, so we aren't. Press release after the jump. The First Sports Activity Vehicle in the Premium Compact Segment: The BMW Concept X1. Once again the successful history of BMW X models is opening up the door for further inspiration in the development of innovative vehicle concepts: The BMW Concept X1 offers all the thrill of agile and versatile mobility in a new segment of vehicles. Proudly presenting this new Concept Car, BMW is offering an outlook at the world’s first Sports Activity Vehicle in the premium compact segment. Through its design alone, this new concept model clearly expresses all the strengths and qualities of such a vehicle, the BMW Concept X1 exuding a strong touch of agility and versatility both in its driving qualities and practical use. And at the same time the Concept Car clearly reveals the stylish elegance of this five-door as well as its modern function. Creating this unique Concept Car, BMW is catering for the demands of a modern target group in search of an up-to-date automobile meeting both the challenges of everyday traffic and the personal needs of many purchasers for an active lifestyle and a versatile driving experience. The BMW Concept X1 expresses that very special sheer driving pleasure so typical in this unique form of a BMW X model combined with a high standard of all-round functionality. So now these qualities are for the first time being carried over to a vehicle in the premium compact segment. Ongoing innovation in the Sports Activity segment established by BMW. As the founder of the Sports Activity Vehicle segment, BMW has already proven its outstanding competence in developing innovative vehicle concepts. Indeed, the German premium car maker first established its position as the leader in innovation in this segment – a position BMW still holds today – in 1999 through the presentation of the first-generation BMW X5. In a market segment previously dominated by conventional off-roaders, the BMW X5, through its outstanding dynamic driving qualities alone, set new standards right from the beginning. Now in its second generation, the BMW X5, through its superior driving qualities and wide range of practical use as well as its luxurious interior ambience, still sets the standard for vehicles in its category to this very day. The exceptional potential offered by this new segment of vehicles also enabled BMW at a very early point to carry over the attractive features of this Sports Activity Vehicle to other market segments. In the guise of the BMW X3, for example, outstanding agility on all kinds of terrain also proved to be a huge success in the segment below the BMW X5. Indeed, the BMW X3 was the first and for many years the only vehicle in this segment to come from a premium manufacturer, with worldwide sales of the BMW X3 now amounting to more than 500,000 units. The ongoing expansion of the BMW X model range is likewise the result of the unique, innovative power offered by the world’s most successful manufacturer of premium cars. The BMW X6 launched this year, for example, is the world’s first Sports Activity Coupé to successfully enter the market. This unique model combining the dynamic lines of a Coupé with the superior power and cultivated robustness of a BMW X model, continues the emphasis on dynamic driving qualities originally initiated with the BMW X5, maintaining BMW’s philosophy most clearly and convincingly. Indeed, BMW has once again, through the BMW X6, set the foundation for a brand-new type of vehicle reaching additional target groups now once again thrilled by the BMW X model concept accounting in the meantime for sales of more than 1.2 million units the world over. BMW X models: unique concept, superior technology, outstanding quality. The global success and great appeal of BMW’s X models results not only from the precise and target group-oriented development of this vehicle concept, but also from the implementation of typical BMW features in this category. Hence, the particular thrill and unique style of every BMW X model forms a perfect match with uncompromising premium quality. The unique driving characteristics of a BMW X model result not just from the concept, but also from BMW’s worldwide leadership in the area of drive systems. And last but certainly not least in this context, the huge innovative power of the BMW Group comes out clearly also in the equipment and features of BMW’s X models featuring superior suspension technology and driver assistance systems as well as a supreme standard of safety and comfort. Yet another essential factor is that every BMW X model combines this exclusive range of qualities with a level of efficiency quite unparalleled in the respective segment: In their balance of performance and fuel consumption, BMW’s X models achieve a standard generally far superior to comparable models built by the competition. Again last but definitely not least, the modern and up-to-date character of BMW’s X models comes out clearly through their stable value, non-partisan market studies regularly confirming the lasting value of the BMW X5 and the BMW X3 as pre-owned cars. All this sets the foundation for BMW’s entry into another market segment where the BMW Concept X1 already reveals the perspectives involved. The Compact Car clearly shows which features are to be expected of a BMW X model in the segment of premium compact vehicles. Through its design alone, the new model clearly belongs to the range of BMW X vehicles – while at the same time it offers all these features in truly individual style representing the design language so typical of BMW. The Concept Car clearly confirms BMW’s claim to offer maximum driving pleasure and efficiency, versatility and functionality, as well as safety, comfort and quality also in the premium compact segment. And with all these factors already being largely considered and taken into account in the BMW Concept X1, it is fair to say that an appropriate production model will see the light of day within just one year. The BMW X1: authentic transition of the BMW X model concept into a new vehicle segment. In its design and driving characteristics, every BMW X model bears out the unmistakable DNA of this kind of vehicle, at the same time showing an individual rendition of the brand and the features typical of the concept. This clearly ensures the authentic transition of the brand values and characteristic features of a BMW X model into each market segment. The BMW Concept X1 naturally lives up to this demanding standard and claim, the Concept Car clearly standing out as a BMW X model from every angle, despite its body dimensions smaller than a BMW X6, a BMW X5, and a BMW X3. At the same time the design of the new car establishes typical BMW features again reflecting the specific characteristics of the premium compact segment and generating new momentum in the appreciation and perception of vehicles in this class. 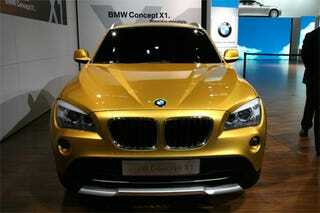 Introducing the BMW Concept X1, BMW is taking on the leading role also in the premium compact class. For the first time the characteristics of a Sports Activity Vehicle are being carried over authentically into this market segment, creating the concept of a vehicle which, in an urban environment, ensures the highest conceivable level of freedom and spontaneous activity. Indeed, the BMW Concept X1 presents mobility options never seen before in this segment. The new model offers versatility and agility in a compact rendition, thus providing a very appropriate interpretation of the sheer driving pleasure so typical of a BMW X model in our current day and age. Measuring 4,457 millimeters or 175.5” in length, the BMW Concept X1 is 108 millimeters or almost 4.3” shorter than the BMW X3. The wheelbase of the BMW Concept X1, in turn, measures 2,760 mm or 104.4”. Through its proportions and four doors together with a large tailgate, the Concept Car hints towards a very generous feeling and experience of space. In addition, the clear design and shape of the vehicle bears testimony to a high level of function meeting all the driver’s and passengers’ requirements in everyday traffic. And last but not least, the BMW Concept X1 combines all these features with the self-confident elegance so typical of a premium vehicle. Through these qualities alone, therefore, the BMW Concept X1 is destined to become the trendsetter for a modern style of urban mobility clearly pointing into the future. Front-end design: dynamic lines, characteristic emphasis on width. The sculptural lines of the new model make the BMW Concept X1 a truly exceptional highlight in the premium compact segment with all the features and qualities of a BMW X model. The front end, the side and rear merge smoothly into one another, their various surfaces forming one whole and striking line creating a smooth and flowing link between the individual elements of the body. Design features typical of the brand additionally emphasise the unmistakable look and impact of the vehicle, the upright BMW kidney grille, dual round headlights cut off at the top, the large, almost square wheel cutouts, the black band stretching around the lower section of the vehicle, the distinctive contour line along the side and the horizontal lines at the rear again clearly confirming that this concept car is a genuine X model from BMW. The powerful stature of a BMW X model comes out clearly in new design at the front end of the BMW Concept X1. The DNA typical of BMW X is also to be found in the strikingly contoured engine compartment lid and the structure of the upright BMW kidney grille with its extra-wide bars positioned far apart from one another at the outside on the BMW Concept X1, thus symbolising the robust nature of the vehicle. Through their sharply cut “eyelids”, the dual round headlights so typical of BMW offer a clear view and focus, white-coloured horizontal covers at the top enhancing this effect to an even higher standard. Innovative surface design highlighting the vehicle’s striking features. Yet another innovative design feature is the three-dimensional surrounds on the headlights. This particular design element to be admired on the BMW Concept X1 and reflected by the surrounds on the headlights and the side window graphics highlights the superior technical character of the headlight units with their clear glass look in a very convincing manner. Again reflecting the typical style of a BMW X model, the fog lamps are positioned far to the outside, just above the air intake scoop. The robust character of the BMW Concept X1 is further emphasised by the car’s underfloor protection. This protection unit bearing clear reference to the use of the vehicle off the beaten track, takes on a particularly sophisticated and elegant style through its silver paintwork – and at the same time the front frame around this protection element forms the lower surround on the air intake. Together with another silver crossbar extending across the entire width of the air intake, this forms two contrasting horizontal lines giving the vehicle an even more powerful and wider look. The surface design of the powerfully contoured engine lid is characterised by six striking contour lines moving towards one another in a V-shape at the front of the vehicle. The two inner lines lead to the BMW kidney grille where they almost meet one another, while the two outer contour lines extend in the opposite direction from the front end of the engine compartment lid all the way to the side section of the vehicle where they continue into the shoulder lines extending all the way to the back. Again, this particular flow of lines emphasises the sculptural design of the BMW Concept X1 connecting all body elements with one another. Side view: an especially sleek look combined with the features typical of a BMW X model. Both the unmistakable proportions of the BMW Concept X1 and the newly interpreted features of a BMW X model come out clearly at the side of the car. The silhouette of this compact five-door is particularly sleek and stretched out, giving the entire vehicle a very sporting and agile look. And at the same time the raked tailgate adds a coupé-like appearance. With its short front body overhang, the waistline slightly lower around the A-pillars, the large wheel arches with their almost square contours and the black plastic protection panels on the lower level of the body, the BMW Concept X1 comes with all the typical features of a BMW X model also from the side. Another characteristic highlight is the visibly low centre of gravity bearing clear reference on the BMW X models to the harmonious interaction of the front and rear wheels in conveying the power of the engine to the road. On the BMW Concept X1 this connection is further highlighted by a crease line on the lower edge of the plastic frame running along the entire length of the sidesills finished in silver. The dynamic, powerful surface modeling of this element provides an attractive interplay of light and shade, again accentuating – like the strong, sturdy and sophisticated underfloor protection front and rear – the refined but robust nature of this new Concept Car. The surrounds on the side windows come in a particularly elegant three dimensional look taking up the design language already to be admired on the headlights and rear lights. Again, this expresses the dynamic contours of the window graphics including the contour-swing at the bottom of the D-pillars well known as the “Hofmeister kick”. Striking flow of lines with that characteristic sweep. The BMW Concept X1 offers a highly attractive interplay of concave and convex surfaces between the characteristic lines to be admired at the side. The interaction of light and shade created in this way gives the entire vehicle a powerful and agile look, the shoulder line extending out of the engine compartment lid and fl owing along the side of the car emphasizing its dynamic character. The lower character line, as it is called, running parallel to the side-sills, creates a unique, exceptional touch in the side view of the BMW Concept X1. This character line starts around the direction indicator at the side, initially moving down slightly and then striving upwards first quite moderately and then with increasing dynamism before tapering out in the rear door. In its sweeping flow of power, the character line ends exactly at the window surround on the window graphics with its “Hofmeister kick”, thus creating the impression of one complete contour extending over the entire side view of the vehicle. The flow of this character line first rising up moderately and then in an increasingly dynamic process offers a particular highlight in design also reflected on the engine compartment lid, on the contours around the rear lights and the lines on the side mirrors, and thus adding yet another striking touch to the BMW Concept X1. Both the robust character and the variable functionality of the BMW Concept X1 are highlighted by the strong and sturdy roof railing extending far back to the rear and ending in the air flow spoiler. Finished in Liquid Silver, the roof railing is indeed yet another feature emphasising the refined look and premium character of the entire vehicle. The BMW Concept X1 comes on 19-inch light-alloy rims in high-quality innovative ten-spoke design again characteristic of BMW’s X models. The newly designed, twin-colour wheels add a special touch of urban sportiness and agility in particularly elegant style. The narrow spokes on the rims, in turn, are twisted slightly to the outside, while the rim bars are cut off at the front, proudly presenting the bright silver colour of polished aluminium. The side flanks and the rim hump, finally, are finished in Dark Grey to provide a particularly sporting contrast. Striking rear view with innovative lights technology. Like the front view, the rear view of the BMW Concept X1 is again characterised by the underfloor protection finished in silver. The rear frame of the broad protection element creates a contrasting colour highlight also at this point, again emphasising the impressive width of the vehicle. In their design, the rear lights combine those unique shapes so typical of BMW and truly innovative technology. The light clusters come with BMW’s characteristic L-contours proudly boasting their typical shape also at night. This unique night design is further highlighted by BMW’s innovative technology, with consistently fluorescent, red-glowing rows of lights fed by LED light units serving as the light source. The result is a genuinely homogeneous flow of light with a powerful signaling effect on energy consumption significantly lower than with conventional lights. Here again, the rear frame of the extra-wide protective element adds an attractive position of the rear light clusters moved far to the outside into the rear side panels. The rows of lights formed by fluorescent tubes continues all round into the side of the vehicle where the lights move up slightly, thus emphasising the L-shaped contours of the light clusters even more distinctly. Again, this three-dimensional look contributes to the characteristic night design of the BMW Concept X1. Last but certainly not least, the paintwork on the BMW Concept X1 emphasises the innovative, modern and sophisticated character of the vehicle, the new Meridian Gold Metallic paintwork colour accentuating the youthful and dynamic look of the Concept Car. Indeed, this strong golden-yellow finish is truly fascinating both in the glow of headlights from other vehicles and in the bright sunshine, creating a highly effective play of light and adding additional momentum to the artistically chiseled surfaces of the BMW Concept X1.